We receive many enquiries for solenoid valves like this -"I need a solenoid valve 1/4" BSP for water, 24V DC and it's direct acting." - Now the customer is often a bit vague about the pressure or the flow (or vice versa), but certain that they want a direct acting type! Now we offer many fine direct acting valves, we even make our own but why should this customer want a direct acting valve? In its simplest form a direct acting solenoid valve consists of a moving magnetic armature (normally a magnetic stainless steel), with a synthetic rubber seal at one end the seal covers and uncovers an orifice in the valve body. A solenoid coil surrounds the tube that houses the armature, energising the coil creates a magnetic field that moves the armature and seal thus opening the orifice allowing the media to flow through the valve, when the coil is de-energised a spring pushes the armature/seal back to the orifice closing the valve. 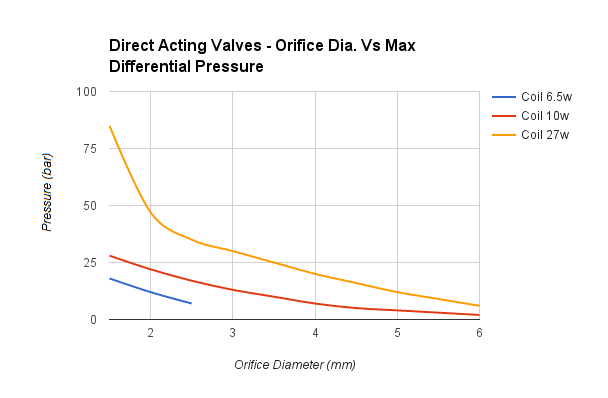 Direct acting solenoid valves are great at small sizes, but things become more difficult as the size of the valve increases; the force required to open the valve is directly related to two things: the differential pressure across the valve and the orifice size, so double the orifice size and the force required to open the valve doubles too. Also as the orifice size increases the stoke of the armature has to increase, and not only does a solenoid become less efficient as the armature moves out of the coil, but it is when the valve is in the closed position with the armature at its furthest point in its stoke that the valve has to operate against the maximum differential pressure across the valve. As the orifice gets bigger either the maximum pressure is reduced or the power of the coil has to be increased and by this we mean a combination of higher electrical consumption and/or a physically larger coil containing more copper wire. Direct acting valves have two competitors: Servo assisted (also called pilot operated), and assisted lift (also called linked diaphragm). The servo assisted valve makes use of the pressure in the media to control the movement of wither a flexible diaphragm or a piston to open ad close the orifice, a small direct acting valve is used to control the pressure above the diaphragm. Modern servo assisted solenoid valves are very effective typically requiring a differential pressure of only 0.1 0 0.2 bar (1.5 - 3psi), but they do need some pressure, so if draining the dregs from a tank or supplying water at a very low flow rate the differential pressure may be below this and so the valve won't fully open. An assisted lift valve operates in a similar way to the servo -valve, here the moving armature is attached to the diaphragm by a spring, when the coil is energised the armature tries to pull the diaphragm open. In this way it overcomes the low pressure limitation of the servo valve. However the choice of assisted lift valves on the market is fairly restricted. Servo and assisted valves do have another weakness - their operation relies on the use of small holes in the diaphragm, if these become blocked the valve won't operate, with a suitable strainer (often built into the valves as standard) to protect the valve this needn’t be an issue for most applications. For most applications a servo assisted valve will be lower in cost and use less power than a direct acting valve that gives the same pressure/flow performance.